Jeff Bezos: Super CEO or Supervillain? Your tech company’s CEO is a bold, visionary leader recognized far and wide as an innovator in the industry. He or she never shies away from embracing Big Ideas or taking risks that most of us would dismiss as foolhardy. The press hangs on this charismatic technology guru’s every word, waiting to see what wisdom he or she will reveal next. And the CEO of your tech company is, in all likelihood, a supervillain. Look, the eerie similarities between the movers and shakers of Silicon Valley and the banes of the Superfriends’ existence have been staring us in the face for a while. Tech CEOs build wondrous gadgets? So do supervillains. Tech CEOs amass wealth and power that mere mortals can only dream of? That’s a move straight out of the supervillain playbook. And tech CEOs do all this from sprawling campuses, with the assistance of an army of eager employees? Swap in “lairs” and “henchmen” for “campuses” and “employees” and you may as well be describing the Legion of Doom instead of Google or Apple. Consider the case of Jeff Bezos, recently profiled on 60 Minutes. The television news program portrayed Amazon’s CEO as a forward-thinking titan of digital industry; but as we watched the segment, we felt the unmistakable buzz of our Spidey Sense tingling. 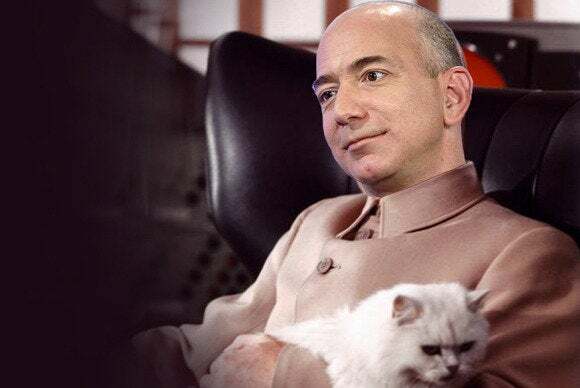 To answer the question on nearly everyone’s lips this week—Is Jeff Bezos a Comic Book Supervillain?—we broke out a list of six sure signs of supervillainy to see where the Amazon CEOs ranks among the Doctor Dooms and Sinestros of the universe. You'l never get away with this, Bezos! Richard Branson will save me! Earlier this year, a Bezos-led expedition recovered rockets that were used to power Apollo moon missions—and that’s not the only time Bezos has dallied with rockets. His Blue Origin private firm wants to build reusable rocket-powered space vehicles. Hey, we all need hobbies, right? And rockets seem like a perfectly harmless way to pass the time—unless, of course, it’s a rocket being built to destroy the Earth, like the one assembled in the Breakworld at the behest of Powerlord Kruun in Astonishing X-Men. Still, we’re sure Bezos’s interest in space travel is perfectly harmless and not at all part of a plan to emulate the villainous Magneto, who lives in a satellite orbiting the Earth. Or is it? Does this mean Jeff Bezos is a supervillain: Possibly. More than a few eyebrows were raised this summer when Bezos ponied up $250 million to buy the Washington Post. Why would the CEO of an online retailer want to become a newspaper owner? Maybe the deal was the part of some grand vision to develop news content for Amazon’s assorted Kindle devices? Both of these men are captains of industry and own newspapers. But only one is a supervillain—maybe. Well, they asked the same question when Lex Luthor bought the Daily Planet and when Norman “Green Goblin” Osborn acquired the Daily Bugle. And neither of those cats bought newspapers because they wanted something to read on their Kindle Paperwhites. Does this mean Jeff Bezos is a supervillain: It doesn’t mean he’s not a supervillain. Want your own island, Larry Page? Perhaps Arcade can offer some tips on real estate and villainy. There’s nothing like having your own private retreat, away from the cares and worries of the everyday world and—more importantly—the prying eyes of any meddling superheroes who might foil your various plots. As Arcade needed his Murderworld, as Magneto needed his Genosha, today’s tech titan needs an island far from pesky laws that might otherwise hinder his or her schemes and plans. Or so Google’s Larry Page would have us believe. Jeff Bezos continues to operate out of the Seattle area which—as of the posting of this article—has yet to descend into a hellish dystopia ruled by the iron fist of a Doctor Doom–like strongman. But if Bezos starts calling fellow CEO Larry Ellison to inquire about what it takes to buy an island, we might want to keep the Bat Signal at the ready. Does this mean Jeff Bezos is a supervillain: No island lair, no supervillainy. Look! An Amazon Prime Air drone delivering a package or possibly mankind’s doom. Nah, it’s most likely a package. Sure, Jeff Bezos—those unmanned aerial drones you’re so excited about are just going to deliver packages to people. Because the whole point of having the capability to send a fleet of flying robots to people’s homes, is so they can get their hands on a copy of Fifty Shades of Grey that much more quickly. Why, it’s all perfectly innocent, these flying robots that can go anywhere in the country at your command! Of course, New Yorkers who found themselves at the mercy of Doctor Octopus’s monstrous Octobots probably have a different perspective. After all, when you find yourself at the mercy of giant metallic robots, two-day ground delivery from UPS doesn’t sound like that big an inconvenience by comparison. 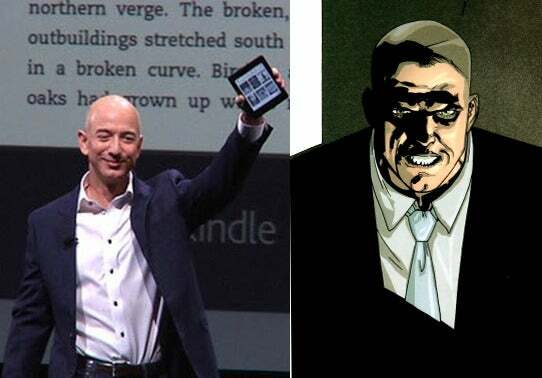 Does this mean Jeff Bezos is a supervillain: All signs point to yes. While Jeff Bezos may want to fill our skies with drones bearing packages—or death from above!—at least he has yet to park a fleet of mysterious boats off the shores of our major cities. The same cannot be said for his chums at Google, who have parked mystery barges in San Francisco Bay and outside Portland, Maine. Google hasn’t exactly been forthcoming about the purpose of these barges, muttering some mumbo-jumbo about their serving as “an interactive space where people can learn about new technology.” If the new technology is “how to enslave humanity” and the interactivity involves battling Skrull sleeper agents, it’s a lesson we’re happy to skip, thanks. Does this mean Jeff Bezos is a supervillain: No, but we’re keeping a close eye on you, Larry Page. Before follicularly challenged readers begin drafting angry emails complaining about cruel stereotyping of the ultra-high-foreheaded, they should ask themselves what Lex Luthor, the Kingpin, the Vulture, Red Skull, Deadpool, Bane, and countless others have in common. Other than a shared desire to bend humanity to their will, it’s their haircuts—or lack thereof. Your beef, friends, is with DC and Marvel, not with us. The Kingpin, Jeff Bezos, and the Vulture—but don’t ask me which is which. Now we’re not saying Jeff Bezos’s pleasingly polished pate is a sure sign of his impending supervillainy. But should he make his next televised appearance in a spandex unitard demanding that we “tremble before me, you pitiful fools,” let’s not pretend that the early warning signs weren’t gleaming at us in direct light. Does this mean Jeff Bezos is a supervillain: Save us, Superman! This story, "Jeff Bezos: Super CEO or Supervillain?" was originally published by TechHive.